Artist’s concept of the Planetary Society’s LightSail spacecraft in orbit. A tiny solar-sailing spacecraft will hitch a ride on the rocket that blasts the United States Air Force's X-37B space plane into orbit on its latest mystery mission tomorrow (May 20). The robotic X-37B spacecraft is scheduled to launch tomorrow at 10:45 a.m. EDT (1445 GMT) atop a United Launch Alliance Atlas V rocket from Florida's Cape Canaveral Air Force Station. The booster will also loft 10 tiny "cubesats," including a spacecraft called LightSail, which is about the size of a loaf of bread. Solar sailing holds a great deal of promise for cubesats, advocates say. These tiny spacecraft don't have a lot of room for onboard fuel, and they generally launch as ride-alongs on rockets carrying much more expensive primary payloads. "The group buying the rocket — the primary payload — they get a little bit nervous about, say, 10 miniature fuel banks on your cubesat when they have a multimillion-dollar payload sitting on top of it," said Jason Davis, a digital editor at The Planetary Society, which is headed by former TV "Science Guy" Bill Nye. "That's what's kind of kept cubesats limited thus far," Davis told Space.com. "So we're trying to show that solar sailing is one way that you can have sort of free propulsion, which could conceivably take cubesats to the next level." LightSail is equipped with a solar sail that, once deployed, will cover an area of 344 square feet (32 square meters). 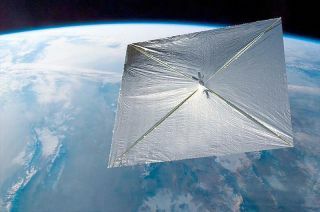 But the spacecraft isn't going high enough to do any real sailing on this mission; atmospheric drag will likely pull LightSail down two to 10 days after it unfurls its sail (a move planned to occur 28 days after the cubesat starts flying freely). But that's just fine, Planetary Society representatives say. This first LightSail flight is a shakeout cruise designed to test out the cubesat's attitude-control and sail systems ahead of a true solar sailing trial with a second LightSail craft in Earth orbit next year. LightSail won't be in the sky for long on its maiden flight, but sharp-eyed skywatchers may still be able to spot the spacecraft after it deploys its sail, Davis said. "It will be naked-eye visible. The trick will be, if you're in the right place at the right time," he said. The Planetary Society will provide viewing maps on its website (www.planetary.org) during the mission, Davis added. Several other sail-equipped cubesats will follow the two LightSails to space in short order: NASA's Lunar Flashlight and Near-Earth Asteroid (NEA) Scout spacecraft are scheduled to launch in 2018, on the first flight of the agency's Space Launch System megarocket. Lunar Flashlight will cruise to lunar orbit and then use its sail as a mirror, shining light into shadowed craters at the moon's poles to hunt for water ice. NEA Scout, meanwhile, is designed to demonstrate a cheap and efficient way to travel to and study asteroids. Both Lunar Flashlight and NEA Scout are bigger than LightSail, and their sail systems are slightly different than that of the Planetary Society spacecraft, Davis said. But the teams behind the NASA vehicles will be keeping a close eye on how LightSail does. "They are actually very interested in us, and we are doing technical exchanges with them," Davis said. "They want to see how our deployment fares — any problems that we might run into — so that they can learn from it for their missions."